A British frigate shadowed a Russian warship through the North Sea near UK waters on Christmas Day, the Royal Navy has revealed. 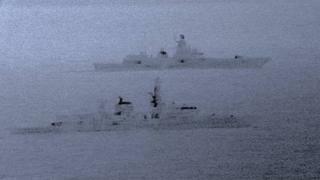 HMS St Albans monitored the Admiral Gorshkov's "activity in areas of national interest", it said. The Admiral Gorshkov, a new guided-missile frigate, is still undergoing trials, Russian media report. The Royal Navy reports a recent "upsurge in Russian units transiting UK waters".